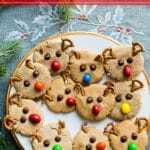 These Rudolph the reindeer peanut butter cookies are super cute and fun of the holidays! In fact, we call them Rudolph and Friends because all the different colored candy noses are his friends. You don’t want to waste any of the colored candies so why not use them for the rest of his reindeer friends? Everyone loves these for Christmas cookies and it’s really one of the most fun and easy Christmas cookie recipes out there. All it takes is a fun attitude, a few ingredients and some help decorating and what you have it a platter of Christmas Joy! The mini pretzels are used for the antlers and you can basically use any shape you want for the antlers. You can use the whole pretzels for the peanut butter cookie antlers, or you can break them into different shapes. Rudolph and his friends can all have a unique antler and look. We used m&m peanut candies for the noses and saved the big red ones for Rudolph noses. The rest of the colors were used for the rest of this reindeer friends. 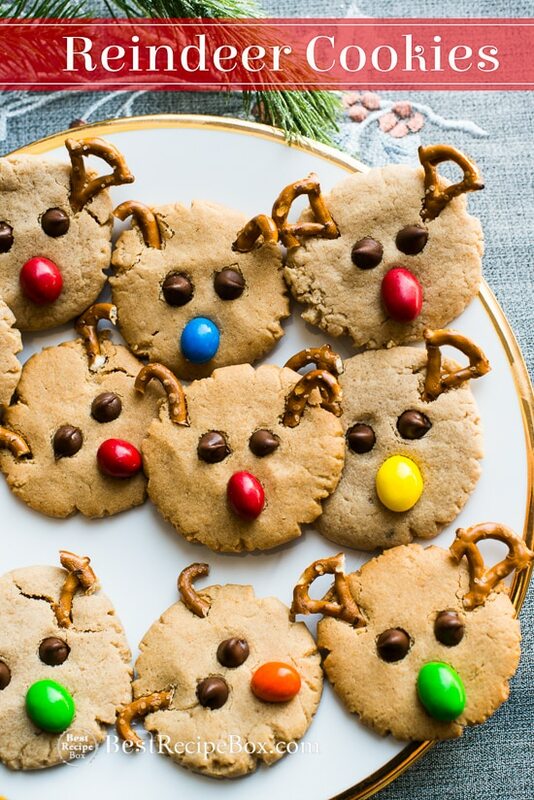 Some recipes use red gummy candies for the reindeer noses, but we find that the peanut m&m’s work best because the flavor goes well with the peanut butter cookies. These cookies also pair perfect with a glass of cold milk. In fact, don’t serve these without the milk because they’re not the same! The rich peanut butter flavor of these cookies taste so much better when they’re washed down with milk. Or if you love coffee, serve it with a hot cup of joe. Make sure to leave some out for Santa because he would love these when he comes down the chimney. And for your Christmas parties, everyone would love these too because they’re not just fun to look at, they’re delicious! The cookies firm up quickly when pulled out of the oven. When they’re too firm, the antlers and candies don’t stick. So we suggest only baking one sheet pan at a time, since you need to quickly place the facial features into the cookies as soon as they come out of the oven and before they have a chance to set. Have all the pretzels and candies ready before you start baking so you aren't scrambling when the cookies come out of the oven. Wet Ingredients: Using hand mixer or in a mixer with a beater blade, mix together peanut butter, butter, and brown sugar until fluffy. Reduce speed to medium and mix in egg and vanilla extract until combined. Dry Ingredients: In another bowl, whisk together flour, baking powder and salt until well combined, about 20 seconds. Stir into peanut butter mixture until combined. Bake for 8-10 minutes or until edges are just lightly browned. 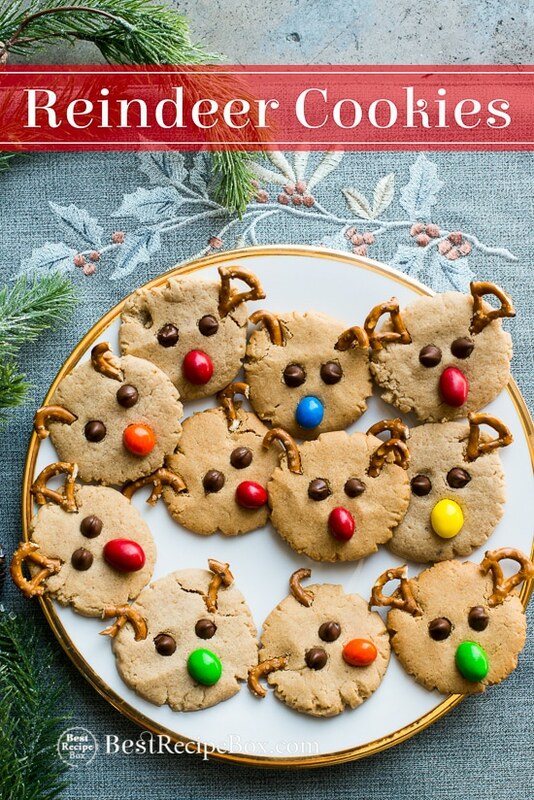 Remove from oven and immediately place eyes, noses, and antlers into cookies. Allow to cool for 5 minutes, then transfer to a wire rack to finish cooling.